Today, I’d like to welcome a very special guest to the Web Journal. Elizabeth Guizzetti is author of the story “Under the Roses” in Wee Folk and Wise: A Faerie Anthology edited by Deby Fredericks. I’ve long been a fan of stories about the fae and a few years ago, I was even on a panel at CopperCon in Phoenix which asked whether vampires or the fae are scarier. Our conclusion was the fae, because you always know where you stand with vampires. With the fae, things aren’t always so clear! Elizabeth shares seven of her favorite films about fairies, many of which I’ve seen and highly recommend. Those I haven’t seen I’ll be checking out. And, as you can see, the fairies in her list aren’t always sweet and innocent. Though fairy tales are everywhere now, both in rewritten and classic form, I have loved fairy stories since I was a little girl. In conjunction with the release of Wee Folk and Wise, I want to share my top seven movies that star fairies, pixies, brownies and the like. Explore the untold story of Disney’s most iconic villain in the classic Sleeping Beauty. In an unforgiving mood after a neighboring kingdom threatens her forest, Maleficent (Angelina Jolie) places an irrevocable curse on the king’s newborn daughter, the Princess Aurora. But as the child grows, Maleficent finds herself becoming fond of the girl. And as the conflict between the two realms intensifies, Maleficent realizes that Aurora (Elle Fanning) may hold the key to peace in the land. Why I love it: A remake of the Disney classic, Sleeping Beauty, Maleficent is a fairy betrayed by her first love. This took the basic story and turned it into a completely different movie. In revenge, she curses the king’s infant daughter Aurora. She soon discovers the other three fairies charged with watching Aurora are negligent. After rescuing the child during her toddler years, Maleficent changes one of the creepiest love stories, it is a mother figure/child love story. By far, this is the best Disney movie I’ve seen. The acting is great. This movie has amazing actors starting with Angelina Jolie and Elle Fanning. They fit each role perfectly The amazing musical score sets the right mood in every scene. A reluctant farmer (Warwick Davis) dreams of learning magic. When his children find a baby in the river, he sets off on a quest to protect the baby from an evil queen. Why I love it: I must have seen this film at least a dozen times when I was a child and a dozen more as an adult. (It played at the dollar theater near my childhood home) This movie has everything: dwarves, brownies, heroes, evil queen, the greatest swordsman that ever lived and a defiant princess. Great directing by Ron Howard, awesome acting by the whole cast, including Warwick Davis, Val Kilmer, and Joanne Whalley, an enchanting and exciting plot, excellent special effects, and plenty of humor and action. In Spain of 1944, the bookish young stepdaughter Ofelia of a sadistic army officer escapes into an eerie but captivating fantasy world. Why I love it: It mixes the gritty real world with a dark fantasy world. No matter where Ofelia is, every scene is staged beautifully. There is graphic violence in the real world which is scarier than the dark fantasy that Ofelia enters. The characters feel so real. The costuming feels rich and the special effects feel lifelike. I am a fan of director Guillemor del Toro and have enjoyed every one he has made. This film was so special to him, he gave up his entire salary to see this film made including back end points. Why I love it: This horror movie is a creature feature of the best kind. The filmmakers are careful to not use the word “fairy” but they used the changeling legends. These fairies steal babies and replace them with their own. They can’t touch iron. Joseph Mawie and Bojana Novakovich move into a new house with their infant. A local farmer tries to warn them against walking in the near by wood and taking down the iron bars that cover their windows. Other than not listening to someone who basically seems crazy, they are smart about their growing problem. Every scene builds upon the suspense, until the viewer is holding their breath. Babysitting infant brother Toby on a Saturday night isn’t young Sarah’s (Jennifer Connelly) idea of fun. Frustrated by his crying, she secretly wishes the Goblins from her favorite book, Labyrinth, will carry Toby away. When her fantasy comes true, a distraught Sarah must enter a maze of illusion to bring Toby back from a kingdom inhabited by mystical creatures and governed by the wicked Goblin King (David Bowie). Why I love it: Awesome puppetry. David Bowie in all his glory. Okay while its about goblins, more than fairies, there are lots of different types of fantastical creatures that Sarah runs into while in the maze. They do show fairies as annoyance, like mosquitos. Talking worms, monsters, dwarves, and as a girl with younger siblings, I identified with Sarah. 10-year-old Fiona is sent to live with her grandparents in a small fishing village in Donegal, Ireland. She soon learns the local legend that an ancestor of hers married a Selkie – a seal who can turn into a human. Years earlier, her baby brother washed out to sea in a cradle shaped like a boat; someone in the family believes the boy is being raised by the seals. Why I love it: It was a sweet family film in a beautiful setting. Though it is a very different movie than The Hallow, like The Hallow, it took a myth seriously which is why I loved it. Jeni Courtney who plays the lead is a sweet girl, but she has an inner strength that moves her adult relatives to action. Those are my top seven fairy films. What are some of your favorites? 2016 has been one wild ride. On the political front, Britain voted to leave the European Union and the United States had the most divisive presidential election I’ve ever seen. We lost a lot of talented people this year ranging from Vera Rubin, the astronomer who discovered dark matter, to entertainers that touched many of us including David Bowie, Carrie Fisher, Gene Wilder, and Anton Yelchin. Despite all that, 2016 has actually been a rather good year, personally. This year, I published two novels. In February, Sky Warrior Publishing released the third of my Clockwork Legion series, The Brazen Shark in which a ship captain takes two dear friends on a special honeymoon getaway, only to have it interrupted by samurai air pirates attempting to overthrow the Japanese emperor. In December, Lachesis Publishing released my horror novel The Astronomer’s Crypt, which tells the story of astronomers, ghosts, drug dealers, and a monster from the beginning of time who collide at a remote observatory during a violent thunderstorm. You can learn about both novel on the books page at my website. In addition to the novels, four of my short stories appeared in anthologies. “Arachne’s Stepchildren” about the potential hazards of discovering new life appeared in The Martian Anthology. “Reckoning at the Alamo” which tells about Marshall Larissa Seaton and Professor Maravilla battling a Lovecraftian entity from across space appeared in Lost Trails 2: Forgotten Tales of the Weird West. “The Jackalope Bandit” which tells about one of Professor Maravilla’s jackalope harvesters being used to rob banks and payrolls appeared in Den of Antiquity. Finally, my retelling of Grimm’s “The Dragon and his Grandmother” appeared in the anthology Gaslight and Grimm which was funded through a very successful Kickstarter campaign. You can learn about all these books at the short story page of my website. I feel privileged to continue my work at Kitt Peak National Observatory where I operate the Mayall 4-meter and the WIYN 3.5-meter telescopes. This year, preparations began for the installation of a new cutting-edge instrument at the Mayall. This will be an instrument that will take spectra of 5000 objects at one time. Starting in 2018, the telescope will be used to survey the entire sky in hopes of better understanding the phenomenon known as dark energy. Part of this year’s preparations included deployment of a prototype instrument, the beginning of a new imaging survey to identify targets for the spectrographic survey, and work on a new control system for the Mayall. As it turns out, I’ll be ringing in the new year at the Mayall, helping with a program looking at a sample of galaxies from the early universe. Over the course of the year, I had the opportunity to make several nice trips. In April, I spent time with two friends at Vermillion Cliffs in Northern Arizona. In May, I traveled to Baltimore for Balticon and the release of the Gaslight and Grimm anthology. In July, I traveled with my family to California for my nephew’s wedding. Speaking of family, my oldest daughter started a paid computer internship at Tulane University this year and opened her own Etsy shop. Meanwhile my youngest daughter has embarked on the adventure of high school. I couldn’t be more proud of these two young women. Perhaps the year’s scariest moment came in November when my wife’s tire blew out on the way home from TusCon in Tucson, Arizona. The car spun on the interstate and went into the mesquite bushes between Texas Canyon and Wilcox on I-10. Fortunately my wife and youngest daughter who were in the car were all right, but the car was totaled. The story had a happy ending when my wife was able to use the insurance money to pay for a nice, albeit used, replacement car. As I say, this year has been something of a wild ride. Although I am admittedly apprehensive about some things happening on the world and national stages, I have several good things on the horizon as well. Come back on Monday and learn about some things to look forward to in 2017. In the meantime, I wish you a very happy and prosperous New Year. Today finds me at the 2nd Annual Steampunk Invasion of Bookmans on Speedway Blvd in Tucson, Arizona from 10am until 4pm. I’ll be signing my novels plus I have a couple of anthologies including my stories. The link takes you to more information. If you’re in Tucson, I hope you’ll drop by. There will be other authors, tea dueling, craft panels, movies, raffles and more. 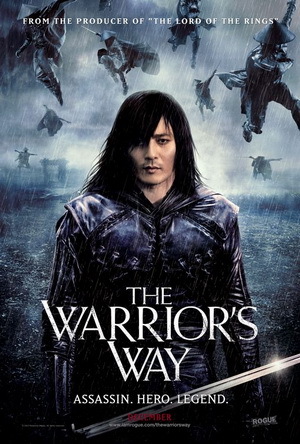 Last night, I watched a 2010 New Zealand-South Korean film called The Warrior’s Way. It tells the story of the greatest swordsman in the world who defeats his enemies, but doesn’t have the heart to kill the enemy clan’s last princess. He flees with her to the heart of the wild west. There he finds a desolate, broken town. At one end of town is a traveling circus that stopped and put down roots. In fact, many of the town’s residents are the circus performers. Our hero, Yang, discovers that he prefers making beauty to constant destruction. Despite that, western outlaws and assassins from his country have other thoughts. The movie has elements of acid westerns, which I’ve discussed, and weird westerns which I write. Filmed on green screen with Geoffrey Rush’s narration, the story has a distinctly fairy tale quality and perhaps that’s the best way to describe The Warrior’s Way. My Clockwork Legion novels straddle the boundary between steampunk and weird westerns. A “weird” western is basically a western story with some element of science fiction, fantasy, or horror. I’ve heard it said that westerns are America’s mythology. There are numerous stories of daring and villainy and they often are metaphorical for the American experience in much the way classical mythology provided metaphor for the lives of those in classical civilization. With that in mind, I’d argue that weird westerns are a uniquely American brand of fairy tale. Wikipedia defines a fairy tale as “a type of short story that typically features folkloric fantasy characters, such as dwarves, elves, fairies, giants, gnomes, goblins, mermaids, trolls, or witches, and usually magic or enchantments.” The American Heritage Dictionary says a fairy tale is “a fanciful tale of legendary deeds and romance.” I think it’s clear that many westerns include tales of legendary deeds and romance. If you throw in any of the characters such as Wikipedia mentions, you’d easily have a weird western. Furthermore, I’d argue that America has often mythologized its innovation and technology to the point that they really fit alongside the magical and supernatural elements found in classical fairy tales, especially when those ideas are carried to extremes not realized in history. Also, coming soon will be my short stories “Reckoning at the Alamo” which will appear in Lost Trails, Volume 2 from Wolfsinger Publications and “The Jackalope Bandit” which will appear in the anthology Den of Antiquity published collectively by the members of the Scribbler’s Den writing group on The Steampunk Empire. Do you have a favorite American Fairy Tale? If so, let me know about it in the comments! This week brings three news items which I hope will be of interest to steampunk fans or those just curious what this steampunk thing is all about! Once Upon a Time, ageless tales were told from one generation to the next, filled with both wonders and warnings. Tales of handsome princes and wicked queens, of good-hearted folk and evil stepmothers. Tales of danger and caution and magic … classics that still echo in our hearts and memories even to this day, told from old, cherished books or from memory at Grandma’s knee. Oh yes, tales have been told … but never quite like these. Journey with us through the pages of Gaslight and Grimm to discover timeless truths through lenses polished in the age of steam. With tales by James Chambers, Christine Norris, Bernie Mojzes, Danny Birt, Jean Marie Ward, Jeff Young, Gail Z. and Larry N. Martin, Elaine Corvidae, Kelly A. Harmon, Jonah Knight, Diana Bastine, and Jody Lynn Nye. My story in the collection is called “The Steampowered Dragon” and is inspired by a little-known tale from the Grimm library called “The Dragon and his Grandmother.” In my version, three reluctant soldiers in India are given everything they ever wanted by a magical, steampowered dragon. Can they solve the dragon’s riddles and keep their freedom? Pre-order the anthology and find out! Also, stay tuned because the book will be launching at Balticon 50 in Baltimore, Maryland this Memorial Day Weekend. I’m planning to be on hand along with many of the other contributors. I’ll announce the plans here soon. Now, I realize pre-ordering things can be a little less than satisfying, though, to tell the truth I do kind of like the anticipation. Be that as it may, the second part of my steampunk trifecta involves instant gratification and its free! I recently read part of my novel Owl Dance for the Creative Play and Podcast Network. Click on the podcast link to listen to my reading or you can download it for offline listening. For some reason, I gave Professor Maravilla something of a British accent when I read him, even though he’s supposed to be from Mexico. Afterwards, though, I realized that although we know he’s Latino and he lived and taught in Mexico, we really don’t know many details beyond that. Perhaps his British accent is a clue to some other aspect of his character. I’ll have to give more thought to what my subconscious was telling me. Finally, for my third bit of steampunk news, one week from today on Saturday, April 23 will be the Steampunk Occupation of Bookmans, which will be held at the Bookmans on Speedway in Tucson, Arizona from 10am until 5pm. You can expect the usual shenanigans from the Tucson Steampunk Society—costuming, tea-dueling, exhibits, crafting. and various vendors—as well movies, literature, and a steampunk swap-meet. Spacial guests include Gentleman Robot and Madame Askew. If you’re in Tucson, I hope to see you there!